REKALP® Topical Solution 5% / 10% v/v contains minoxidil, at a concentration of 50 mg / 100 mg minoxidil per mL in a solution composed of alcohol. Minoxidil, a peripheral vasodilator, occurs as a white or off-white, odourless, crystalline solid which is readily soluble in propylene glycol or ethanol, soluble in water to the extent of 2 mg/mL and is almost insoluble in acetone, chloroform or ethyl acetate. The chemical name for minoxidil is 2, 4-diamino-6-piperidino-pyrimidine-3-oxide (MW = 209.25). When applied topically, REKALP® (minoxidil) has been shown to stimulate hair growth in males and females with alopecia androgenetica; however, the exact mechanism of action of REKALP® in the treatment of alopecia androgenetica is not known. The regrowth can be observed after approximately 4 or more months of use and is variable among patients. Upon discontinuation of treatment with REKALP®, new hair growth stops and restoration of pretreatment appearance may occur within 3-4 months. Topical application of REKALP® showed no systemic effects related to absorption of minoxidil when tested in controlled clinical trials in both normotensive and untreated hypertensive patients. Following topical application, minoxidil is poorly absorbed from normal intact skin, with an average of approximately 1.7% of the total applied dose ultimately reaching the systemic circulation. In contrast, minoxidil is almost completely absorbed from the gastrointestinal tract following oral administration of minoxidil tablets. Following cessation of topical dosing of REKALP® approximately 95% of systemically absorbed minoxidil is eliminated within 4 days. The effects of concomitant dermal diseases on absorption are unknown. The metabolic biotransformation of minoxidil absorbed following topical application has not been fully determined. The active form of the drug appears to be a sulfated metabolite, minoxidil sulfate. Treatment (regrowth) of androgenic alopecia in males and females and stabilisation of hair loss in patients with androgenic alopecia. Topical minoxidil is contraindicated in patients with a history of hypersensitivity to minoxidil, propylene glycol or ethanol. Before starting on REKALP® the patient should have a healthy, normal scalp. Although extensive use of topical minoxidil has not revealed evidence that enough minoxidil is absorbed to have systemic effects, greater absorption because of misuse or individual variability or unusual sensitivity could lead, at least theoretically, to a systemic effect, and patients need to be aware of this. 8. the potentiation of the orthostatic hypotension produced by guanethidine. Patients with known cardiovascular disease or cardiac arrhythmias should contact a physician before using REKALP®. REKALP® is recommended for use only in healthy adults with normal cardiovascular status. The safety is unknown in patients with cerebrovascular disease, ischaemic heart disease, cardiac arrhythmias or congestive heart failure. Patients with a history of underlying heart disease should be aware that adverse effects in them might be especially serious. The consumer should stop using the product and see a doctor if hypotension is detected or if experiencing chest pain, rapid heart beat, faintness or dizziness, sudden unexplained weight gain, swollen hands or feet or persistent redness or irritation of the scalp. Customers using REKALP® should monitor if systemic effects should occur, discontinue use of REKALP®. If necessary, fluid retention and oedema can be managed with diuretic treatment. Tachycardia and angina can be controlled by administration of beta-adrenergic blocking drugs or other sympathetic nervous system suppressants. HOWEVER, its advised to seek medical advice before starting REKALP® from a Dermatologist. Topical minoxidil therapy should be stopped if hair regrowth is not evident after 12 months of treatment. REKALP® contains an alcohol base which will cause burning and irritation of the eye. In the event of accidental contact with sensitive surfaces (eye, abraded skin, mucous membranes), the area should be bathed with copious amounts of cool tap water. Inhalation of the spray mist should be avoided. The effects of REKALP® in patients with concomitant skin diseases, or in those using topical corticosteroids or other dermatological preparations, are unknown. There is a possibility that an increase in bioavailability, of topically administered minoxidil, may occur in the presence of inflammatory conditions of the scalp and such situations are to be avoided. If a patient wishes to wear any form of protective headgear, he should be instructed to allow 1 hour to elapse after using REKALP® before covering the head. Some patients have experienced changes in hair colour and/or texture with REKALP® use. Carcinogenic activity of minoxidil has been investigated following dietary administration to mice at 10-64 mg/kg/day, and following topical administration to mice and rats at 8-80 mg/kg/day. Minoxidil treatment was associated with the development of benign pituitary tumours and malignant mammary tumours in female mice, hepatic adenomas and splenic haemangiosarcomas in male mice, and adrenal medullary and clitoral gland adenomas in female rats. The hepatic tumours were only observed at high dose levels. The development of mammary adenocarcinomas in mice may be related to stimulation of prolactin release. Tumour development in the pituitary, preputial and clitoral glands may also involve endocrine mechanisms, while the vascular wall tumours in mouse spleen and adrenal medullary tumours in rats may be related to the vasodilator activity of the drug. In a 12-month photocarcinogenicity study in hairless mice, topical minoxidil did not accelerate the development of dermal tumours initiated by ultraviolet light. Genetic toxicology studies showed that minoxidil does not cause gene mutation in bacterial cells, but gene mutation studies in mammalian cells have not been reported. Minoxidil had weak clastogenic activity in a cytogenetics assay in Chinese hamster lung cells in vitro, but there was no evidence of similar effects in cultured human lymphocytes, or in an in vivo assay (micronucleus test in mice). Minoxidil did not cause DNA damage in an alkaline elution assay in Chinese hamster fibroblasts or unscheduled DNA synthesis in rat hepatocytes. In fertility studies in rats, minoxidil decreased live litter size at oral doses of 3-10 mg/kg/day and at 80 mg/kg/day SC. Animal studies have shown a risk to the foetus at exposure levels that in comparison to levels obtained in humans are very high and showing signs of maternal toxicity. The risk of foetal harm is low if topical minoxidil is administered as directed during pregnancy. There are no adequate and well-controlled studies in pregnant women. Minoxidil should be used during pregnancy only if the potential benefit justifies the risk to the foetus. Systemically-absorbed minoxidil is secreted in human milk. REKALP® should not be used by nursing women. Subcutaneous administration of minoxidil at 80 mg/kg/day to lactating rats suppressed postnatal growth and increased postnatal mortality of the offspring. These effects may have been due to interference with nursing behaviour rather than to ingestion of drug-related material by the offspring. Safety and efficacy of REKALP® in patients under 18 years of age have not been established. Safety and efficacy of REKALP® in patients over 65 years of age have not been established. In general REKALP® is well tolerated. The dermatologic events were of similar type and severity in the 5% and 2% groups. Most frequently reported adverse reactions with 2% and 5% topical minoxidil in commercial marketing experience are dermatological reactions and include: local erythema, itching, and dry skin/scalp flaking, skin irritation, rash, and dermatitis. Increased hair shedding can occur due to minoxidil's action of shifting hairs in the resting telogen phase to the growing anagen phase (old hairs fall out as new hairs grow in their place). This temporary increase in shedding generally occurs two to six weeks after beginning treatment and subsides within a couple of weeks (first sign of action of minoxidil). Rare cases of hypotension have been reported. Rare cases of hypertrichosis (unwanted non-scalp hair including facial hair growth in women) upon initiation of therapy with REKALP® have been reported. There are currently no known drug interactions associated with the use of REKALP®. Although it has not been clinically demonstrated, there exists the theoretical possibility of absorbed minoxidil potentiating orthostatic hypotension in patients currently taking peripheral vasodilators. In vitro studies have shown that paracetamol and diethylcarbamazine may inhibit the stimulation of hair growth by minoxidil. Drugs for cutaneous use, e.g., tretinoin and anthralin/dithranol, which alter the stratum corneum barrier, could result in increased absorption of cutaneously used minoxidil if applied concurrently. 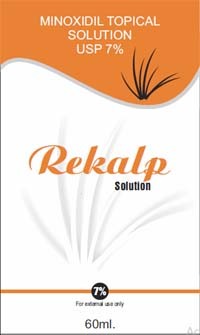 Do not apply REKALP® to any area of the body other than the scalp. A total dose of 1 mL REKALP® should be applied twice per day to the scalp, beginning at the centre of the affected area. This dose should be used regardless of the size of the affected area. The total daily dose should not exceed 2 mL. After applying REKALP®, wash hands thoroughly. Apply REKALP® when the hair and scalp are thoroughly dry. Do not use a hairdryer to speed the drying of REKALP®, because blowing air on the scalp may decrease the effectiveness of REKALP®. REKALP® must remain in contact with the scalp for several hours (up to 4 hours). At least four months of twice daily applications of REKALP® are generally required before evidence of hair regrowth can be expected. Onset and degree may be variable among patients. Note: Following discontinuation of medication, relapse to pretreatment appearance has been reported to occur within 3-4 months. REKALP® Topical Solution 5%/10%v/v , containing 50 mg /100 mg minoxidil per mL is available in a 60 mL bottle, in single packs.